Of all the cities in Spain that we have visited, Cordoba has always held an attraction to us. It's one of the most wonderful and diverse cities in Spain. From the minute you enter the city, the warm welcome is evident. 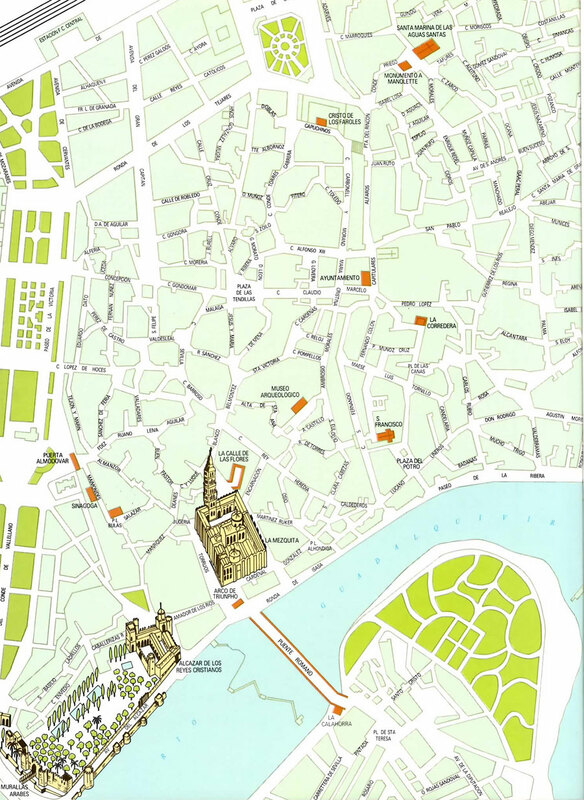 Cordoba is easy to get to via major motorways and we found the area around the Cathedral the best place to start a tour. You can explore historical Cordoba on foot or treat yourself to a horse and carriage ride. Don't even think about driving into the historical centre as parking is all but impossible. Modern Cordoba blends perfectly with old Cordoba. The modern, pedestrianised areas merge seamlessly with the old narrow streets of the Juderia, the old quarter that houses the world famous mosque. Cordoba is rich in history and was settled by the Romans in 152BC, after which it enjoyed 6 centuries of rich trade in olive oil, minerals and wool. The Moorish conquest in the 8th century left the city rich in Islamic culture and architecture. The Mezquita (Cathedral) in Cordoba is considered the most important Islamic monument in the western world and although it has been a Cathedral since the Christian re-conquest, the evidence of the former mosque is very clear. The main doorway opens up to reveal a huge cobbled courtyard, the Orange Tree Patio. It is lined with tiny water courses and low trees. Construction of this amazing building began in 784 by Abd-al-Rahman II. As you wander through the many rooms of the Cathedral you will notice a wide variety of construction styles ranging from Islamic to Mudejar and Renaissance. The Cathedral is open Mon-Sun 10am-7pm but visits are interrupted on Sundays for services. Entry includes access to the Alcazar and the Torre de la Calahorra. Close to the Cathedral is the Puerta del Puente and the San Rafael Monument (left). Before you move on, call in at the tourist office. It must be one of the most unique in Spain. It is located within the Congress Palace near the Cathedral. The setting is a chapel and there's a great scale model of the Cathedral on display. 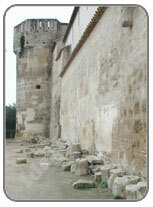 Follow the suggested tourist route to see the Alcazar de los Reyes Cristianos which was built in 1327 by Alfonso XI. It incorporates a royal house and gardens which are a pleasure to walk round. Wander along the cobbled paths and see the water courses stocked with fish and water plants. There are original Roman carvings and columns scattered about everywhere. Cross the main road from here and cross the river by means of the Roman Bridge (see right). Very little Roman brickwork remains as it has been patched up so many times. You end up at the Torre de la Calahorra, dated 1369. Originally a defence tower, it was used as a jail in the 18th century and a school for women in the 19th century. Today it houses a museum and has 14 rooms to explore. Open Mon-Sun 10am-2pm and 5.30pm-8.30pm. The Synagogue in Cordoba is one of only two such buildings in Spain. Entry is free and the plasterwork is quite something. It's located in the Juderia (Jewish Quarter). 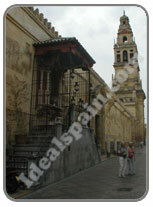 Capuchinos Square is one of the most significant places in Cordoba. Surrounded by whitewashed buildings, it was built in the 17th and 18th centuries, along with the convent there. In the centre of the square is the most worshipped place in Cordoba, a large and unusual crucifix surrounded by wrought iron lamps. The Palacio de Viana dates from the 14th century and because of its 12 inner courtyards, is known as the Museum of Cordovan Patios. The inner rooms house rich collections of porcelain, mosaics, paintings and firearms. Pictured left is the Corredera the most famous plaza in Cordoba. It used to be used for public executions, performances and bullfights. Nowadays, enjoy the bars and restaurants there or the weekly flea market. There are many plazas and shady parks in Cordoba so you will always have somewhere to rest. In the hot summers, shade is valuable. Throughout Cordoba there are lots of monuments and statues but most famously, Cordoba has thousands of highly decorated patios. So much so that every year there's a week long competition for the best patio. The Museum of Fine Arts is well worth a visit. The area around the Cathedral is lined with tacky touristy shops and stalls but venture into the backstreets and you will find a maze of tiny, individual shops. Silverware is popular in Cordoba and is excellent value for money if you shop around. Handmade leather and wooden goods are also good quality and popular. Cordoba is on the main Madrid-Seville train line and as such has regular high speed trains every day. There are also regular AVE/Talgo trains to Malaga, Cadiz, Valencia and Barcelona. Cordobas' railway station is on Avenida de America. Tel 957 490 202. Buses leave from the Alsina Graells terminal for Granada, Cadiz and Malaga as well as local towns. Buses for Madrid, Valencia and Barcelona leave from the Urena terminal on Avenida de Cervantes, Tel 957 472 352. The local bus network is complicated and doesn't always drop you near to your desired destination. Taxis are abundant in Cordoba and often the best option for short journeys.